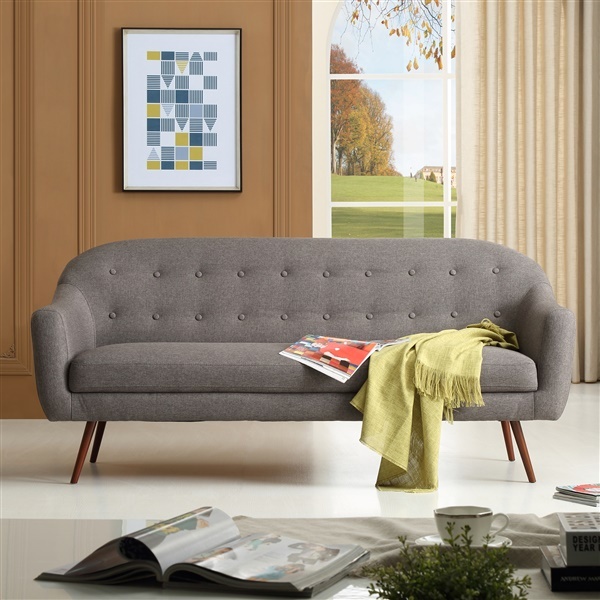 The Elaine Sofa delivers a uniquely chic Danish-inspired modern look defined by its organically-shaped silhouette, smooth seating surface, stylish button tufting and thin tapered legs. Upholstered in a 1950s reminiscent microtweed fabric, the Elaine Sofa's solid wood frame, sinuous spring system, and sleek continuous seat cushion that stretches arm to arm will generously seat and comfortably support three guests. The Elaine's distinct shape can be traced back to mid-20th century Scandinavian influences. Its appreciation for simplicity, organic forms and for its materials were signature characteristics exhibited in the works of designers like Finn Juhl, Hans Wegner and Torben Lind. A centuries-old technique, tufting, was a favorite among notable designers of modern furniture, from the Bauhaus period to present-day. From Le Corbusier and Van Der Rohe to Hans Wegner and Ducaroy, the times have proven that clean lines and accented button tufting never goes out of style. While many of the distinguished works produced by such makers remain available today at a premium, the Elaine Sofa provides an iconic look at an unparalleled value. Love the design, even better throwing on some accent pillows with it, gorgeous! It was an easy decision ordering from inmod, everything i've ever received has arrived quickly and resembles the pictures and features perfectly, this sofa is no exception, thank you! Even roomier than I thought it would be! Comfy and soft, the whole family loves it! I was given the go-ahead on purchasing our waiting room a new sofa as the other one was looking shabby and out of date - we are going for a much more contemporary and stylish look as we want to attract more high-end clients. It's been here for about a week and we've already received numerous compliments on how well it looks and how comfortable it feels. We haven't even changed much of anything else yet so this was a really great buy! New favorite place to lounge in the house! Totally moved myself from our comfy recliner chair to this comfy little number! Had no idea how comfortable it would be! I must have spent 3 weeks looking at sofas online. 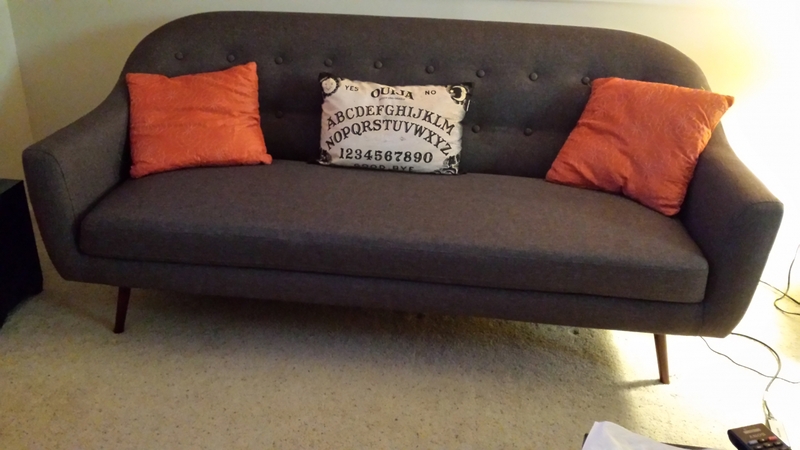 I really wanted the green in this sofa, but my husband balked, so I went with dark grey. It has a lot of brown undertones to it, so if you are looking for charcoal, this isn't it. It is very pretty, and the legs are easy to install. It isn't as comfortable as the1992 sofa that it replaced, but it's more stylish. Since it weighs only 75 pounds, we didn't pay to have it brought to the door. If you do the same, be warned that the delivery company will basically leave it in the street, next to the curb. The sofa is in a box that sits on a heavy, wood palate, and the entire thing is wrapped in plastic, bringing it to 174 pounds! ProsGood size for a smaller room. Nice curves. ConsBrown undertones in the dark grey fabric. Love the rounded curves to this sofa!! Trying to redesign my living room so most of my pieces have a slight curve to their form in one or another - perfection!! Just the right size and right fit for my living room! So happy I ordered from Inmod! Cushions are the perfect balance of soft and firm, comfortable and supportive, thank you! Firm cushions but also very comfortable! love the look of the button tufting and tapered legs. Thank you! You can't beat the price for this awesome modern sofa. It's comfortable for every day use but also structured so it maintains it sophisticated look. Loving my Inmod sofa!!! I ordered the grey color for my living room and ended up getting the green for my family room. ProsThis is so comfy! And the colors are awesome! I'm glad I bought both. Very happy with the sofa and the service. For under $600 you cannot go wrong. All screws fit in holes, Fabric is a good color and tight. Sofa is pretty cool. I ordered 2 of these for my living room. They look good, but assembly was rough since the holes in the couch did not line up with the holes on the legs. On both couches there were one or two screws that I could not fit in at all because they would have hit metal, and another 1 or two that could only be screwed in part way. It seems steady. What is the seat height and depth? The seat height of the Elaine Sofa is 18 inches, and the seat depth is 22.5 inches. What is the minimum width requirement for the doorway? The Elaine Sofa can fit through a standard 32" width doorway. What is the weight capacity of this sofa? The weight capacity per seating area on this sofa is 250 lbs. (there are 3 seats on this sofa). What are the fabric and cushions made with? How many weeks is delivery on this item? The lead time for delivery of the Elaine Sofa is 1-2 weeks. The seat cushion on the Elaine Sofa is not removable. what upholstery colors and fabrics are available? The Elaine Sofa is offered in light grey, dark grey or green.